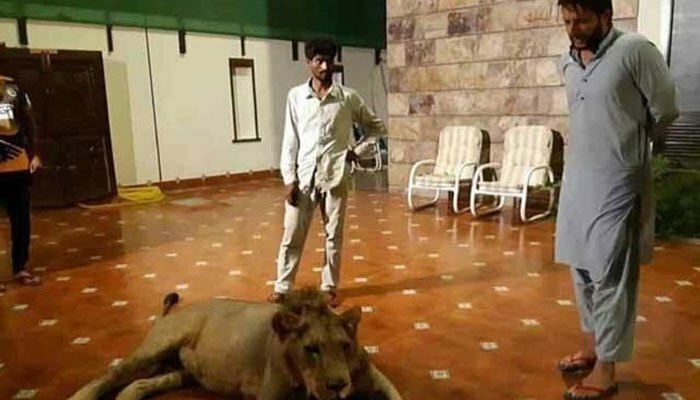 KARACHI: The Sindh Wildlife Department on Friday launched an investigation into the alleged presence of a chained lion at Shahid Afridi’s residence, days after the star cricketer posted photos with the animal on his social media. Sindh Wildlife Conservator Taj Muhammad Shaikh, who called for a probe into the incident, said the inquiry would be completed after Eid following which the appropriate course of action would be taken. Afridi, responding to the backlash, clarified that the lion was not his, but was owned by his friend who also held the license. The 38-year-old added that his friend had only brought the lion over to his house for some hours, and he had put a chain around the animal as a protective measure. Shaikh confirmed that the lion’s owner was not Afridi, but a man named Hassan Hussain but said the department would nonetheless probe what the lion was doing at Afridi’s house.